A lecture about the original corner bass trap with treble diffuser, the TubeTrap. This paper discusses the physics behind how corner loaded bass traps work. It was written over 20 years ago, just as the ASC TubeTrap had recently been introduced for use in hi-fi audio. The idea of bass trapping was limited to recording studios at the time, and were huge and expensive boxes. However, the idea of corner loading with bass traps had never been considered and was a revolutionary concept at the time. We're going to talk tonight about the musical tone burst and its transients, and about small rooms and their corners. We'll blend these topics together into the problem area of low frequency room articulation and then show how bass traps help the situation. Finally, we'll discuss the new generation of bass traps we've developed over the last two years. Traditional testing of rooms utilizes both pink noise and slow sine sweeps to evaluate the suitability of the room for listening. Music is neither noise nor steady state tone. The ability of the room to articulate music is closely related to its ability to track the details of each discrete tone burst. 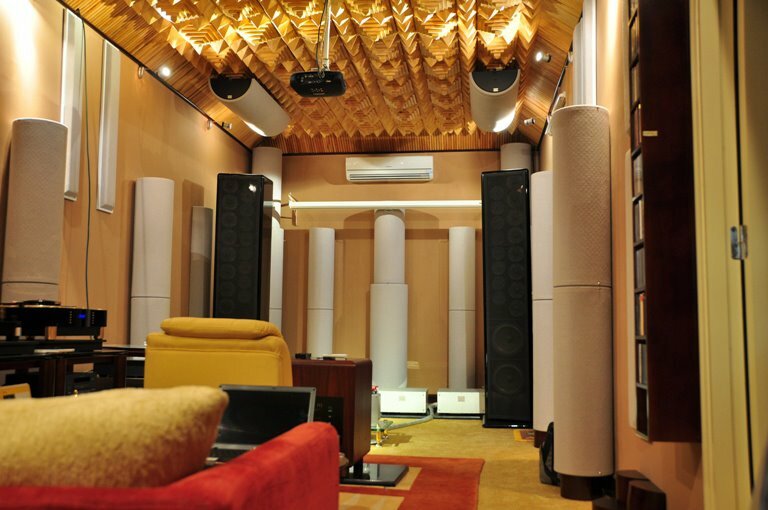 The typical listening room is frequently without proper low frequency decay constants. Instead of actively tracking the tone burst, the room distorts both of the burst transient: attack and decay. Let's start by looking at the tone burst decay. In a furnished room without bass traps the low end tone burst decay will vary between two extreme characteristics, first there can be the prolonged decay -- that boomy sound -- because the frequency of the tone burst matches one of the room's resonant mode frequencies. The second decay extreme occurs when the room is driven at a non-resonant frequency. This so-called anti-resonant frequency decay is characterized by an initial very rapid decay rate, followed by a resurgence of sound to within 10 dB of the original level. Detailed observation shows that the resurgent sound has changed frequency of a nearby resonant mode -- that is some components of a musical chord actually change frequency during the decay, resulting in 'room coloration' of the music. The location of bass traps in a room needs to facilitate the damping of all resonant modes. There are eight places in each rectangular room where high sound levels exist for all from resonance modes. There are the tri corners-for example, the intersection of 2 walls and the floor. Each tri corner is part of each of the three sets of parallel walls that determine the room's resonance mode. Properly designed bass traps can be installed in the tri corners to dampen all resonance.